Don’t Make Dull Holiday Cards… Make Unique Drag & Drop Memories! Imagine greetings created with drag & drop ornaments that can be personalized, colorful holiday sayings against custom designed backgrounds,then in one-click you create a signature template that can be used over and over. • 104 Drag and Drop Ornaments that can be customized with your own photos. • 338 greeting card backgrounds in sizes 5″ X 7″ and 4″ X 8″ horizontal and vertical. • 52 one-click actions for making instant cards that are print ready! • Preprint templates for litho printing folding cards. ● 104 Drag and Drop Ornaments that can be customized with your own photos. ● 338 greeting card backgrounds in sizes 5" X 7" and 4" X 8" horizontal and vertical. ● Preprint templates for litho printing folding cards. 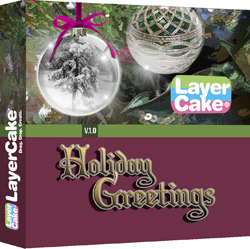 The LayerCake Yuletide collection includes 125 - 300 dpi holiday backgrounds in sizes 11" X 14" and 12" X 24". Subjects include: Santa, ornaments, wreathes, religious scenes, elves and snowmen.Each background is able to be resized (i.e., cropped) to fit any custom matt size; made into holiday cards; used to dress up your holiday website; or, even used as digital backgrounds. There is nothing else like it on the market!It's all Photoshop so there's no new software to learn, Mac or PC!